Please join us on Tuesday, February 5, to hear Captain Marian Schneider talk about her memoir, There’s A Captain In You. After her talk, she will be happy to sign copies of her book. A self-proclaimed steward of the environment, Captain Marian ushered in the concept of ecotourism before it was widely understood or appreciated. From the onset her goal was to share the immense beauty of her immediate surroundings while underscoring the urgency of preserving it for future generations. Captain Marian is quick to say that introducing the first kayaks to Charlotte County ranks among her proudest achievements. They were the vehicle through which people were able to connect immediately with nature and provided an explosion in the popularity of her enterprise. More importantly, though, she touched many thousands of lives and spread the legacy she’d inherited from her father. She empowered many to enjoy, respect and protect the bounty nature had blessed them with. 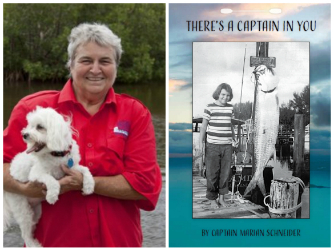 There’s A Captain In You is an inspiring memoir by Captain Marian Schneider who created a business based on the dream of sharing and preserving the Gulf Coast environment in and around Boca Grande, Florida. Her father’s shared passion for nature, his repeated teaching “if you teach people to love something, they’ll take care of it,” and a boat were the foundation upon which Marian built her business, Grande Tours.A self-proclaimed steward of the environment, Captain Marian ushered in the concept of ecotourism before it was widely understood or appreciated. From the onset her goal was to share the immense beauty of her immediate surroundings while underscoring the urgency of preserving it for future generations. Captain Marian is quick to say that introducing the first kayaks to Charlotte County ranks among her proudest achievements. They were the vehicle through which people were able to connect immediately with nature and provided an explosion in the popularity of her enterprise. More importantly, though, she touched many thousands of lives and spread the legacy she had inherited from her father. She empowered many to enjoy, respect and protect the bounty nature had blessed them with.